I don't know if I've confessed it here before, but my favorite desserts aren't chocolate. I like chocolate, but I LOVE fruit desserts, caramel and butterscotch. So I knew I would love these bars. And no recipe from Mel ever disappoints. These are full of oat-y goodness and because they travel well, make a great treat for a picnic. They're also great just for snacking - and not too guilt-inducing! Find more great recipes at Inspiration Monday, Mix it Up, Inspire Me, Clever Chicks, Create Link Inspire, Tasty Tuesday, What's Cooking, Hearth and Soul, Friday Finds. In a medium bowl, whisk together the flour, oats, baking soda, and salt. Place the 3/4 cup butterscotch chips in a large bowl. In a small saucepan, melt the butter over medium heat and let the butter cook until golden brown in color, about 10 minutes, taking care not to burn. Pour the hot butter over the butterscotch chips and whisk together until melted and smooth. Whisk in the brown sugar until combined. Whisk in the egg and vanilla. Stir in the flour mixture, just until incorporated. Line a 9x13 baking pan with foil; spray the foil with nonstick spray. Scrape the batter into the prepared pan and smooth the top, spreading the batter evenly to the edges. Bake the bars at 350 until a toothpick inserted into the center comes out with just a few moist crumbs, about 16-18 minutes. 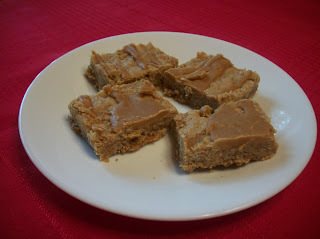 For the glaze, place the 1/4 cup butterscotch chips, brown sugar, water and salt in a small microwave-safe bowl. Microwave the mixture until melted and smooth, about 2 minutes on 50% power. Whisk to combine well. Drizzle the glaze over the warm bars. Let the bars cool completely in the pan before removing them using the foil. Cut into small squares. Thanks for your Submission to our link party. You can see it here http://bit.ly/1VtYu3d (you were featured). You can also see it on our Pinterest board here http://bit.ly/1VtYmk5.